The five lancets in the west above the balcony represent Law, History, Philosophy, Astronomy and Medicine. Strange creatures and gargoyles adorn the roof at the ends of the beams. The outer walls, built of Montreal limestone in fitting with the rest of the campus, have the symbols of the Four Evangelists carved onto them to remind students of the highest possible wisdom. 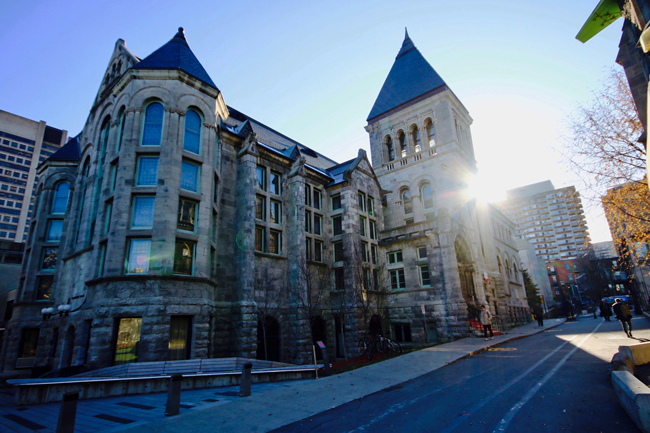 The building was bestowed upon McGill in 1893 due to the beneficence of Peter Redpath, owner of Redpath Sugar and one of Montreal’s leading citizens at that time, and his wife Grace Wood. The five lancets in the west above the balcony represent Law, History, Philosophy, Astronomy and Medicine. Strange creatures and gargoyles adorn the roof at the ends of the beams. The outer walls, built of Montreal limestone in fitting with the rest of the campus, have the symbols of the Four Evangelists carved onto them to remind students of the highest possible wisdom.